This is an original piano arrangement of the popular Christmas favorite, "We Need a Little Christmas" (from MAME). 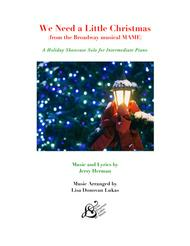 This all-time Christmas classic has been carefully arranged for the intermediate pianist, by Lisa Donovan Lukas. It is an ideal showcase piece for a holiday recital, Christmas gathering, group lesson, or any special performance occasion. To listen to more of Lisa's original compositions and arrangements, please visit: www.lisadonovanlukas.com Lisa's original piano music can also be found at Piano Pronto's Composers Community.